Work on carb non roller HO? Community Q&A Question: Work on carb non roller HO? Will these bolt on to a non roller 5.0 HO (1984 GT) without any other modifications? While they will bolt on, you will need a set of head bolt reducers and if you are not running a hydraulic roller cam, you will have to change the valve springs to match your style of camshaft. 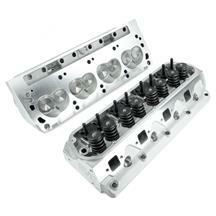 Also, you will have to purchase a set of stud mount rocker arms and a set of hardened pushrods.